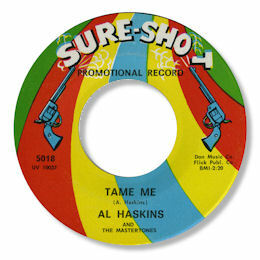 Haskins’ rare Quest 45 from Washington, DC has two solid southern style nmbers on it but neither is a patch on the excellent Tame Me. The chord changes feel just right to me, and the harmonies from the Mastertones are really good. The horns are right at the front of the mix where they should be – check out the great baritone sax – but the best parts of this super deep ballad are Haskins' own fiery vocals and the guy from the background who adds his own little interjections. This really brings out the church based style of the whole thing.